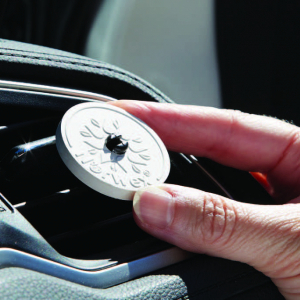 Ceramic Car Vent Clips, paired with Norwex Essential Oils, are free of the synthetic chemicals found in most car freshener sprays and cardboard fragrance discs. Just 1 or 2 drops of Essential Oil on the back of the disc will then gradually release the scent in the air, to restore freshness to your car’s interior, naturally. Where to use: Attach easily to your car’s air vents and won’t obstruct your vision like hanging cardboard. Pack of two Car Vent Clips is ideal for two-car household. How to use: Just 1 or 2 drops of Essential Oil on the back of the disc will then gradually release the scent in the air, to restore freshness to your car’s interior, naturally. Attach to one of your car’s air vents and add a drop of Essential Oil to refresh scent periodically. You can buy the Norwex Car Vent Clips online from me, in Australia. Or you can buy them in New Zealand here. If you are elsewhere, check Norwex.com to find a consultant in your country.